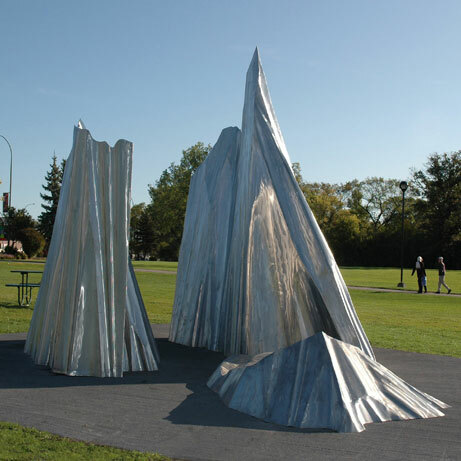 Gordon Reeve responded to a national Call to Artists for a site-responsive artwork for Assiniboine Park. 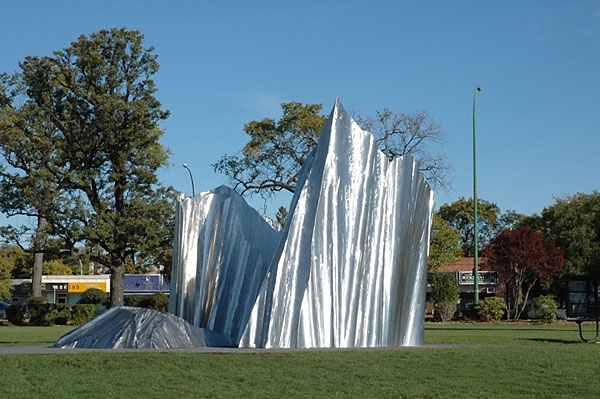 His proposal was selected from a shortlist of five that included artists from Ontario, Manitoba and Quebec. One of Winnipeg’s largest and most loved city parks, Assiniboine Park celebrated its one-hundredth anniversary in 2005. Although designed in the English Landscape Style the Park is firmly rooted in the Prairie landscape. 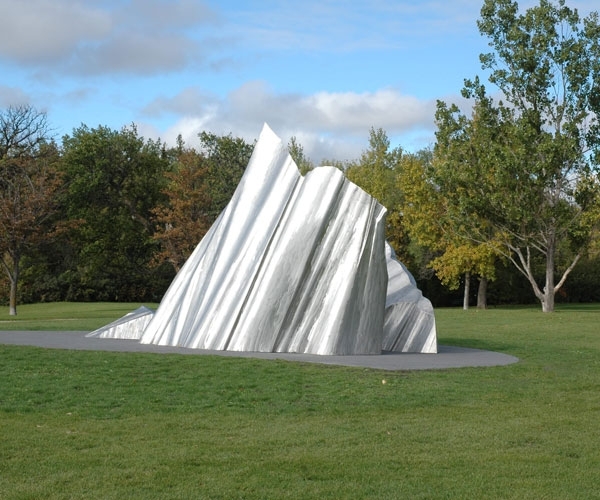 Assiniboine Park is a vital gathering place, and the artwork is located in an important transition area. Artists were asked to consider, among other things, the natural landscape, the history of the area and public access to the work. Agassiz Ice recalls glacial Lake Agassiz that in prehistoric times covered most of the province of Manitoba. 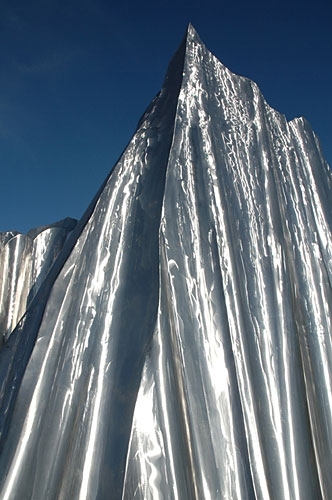 Gordon Reeve has created three large sculptures in stainless steel that evoke icebergs. The smallest of the three was specifically created to be used as a resting spot, low enough for seating. 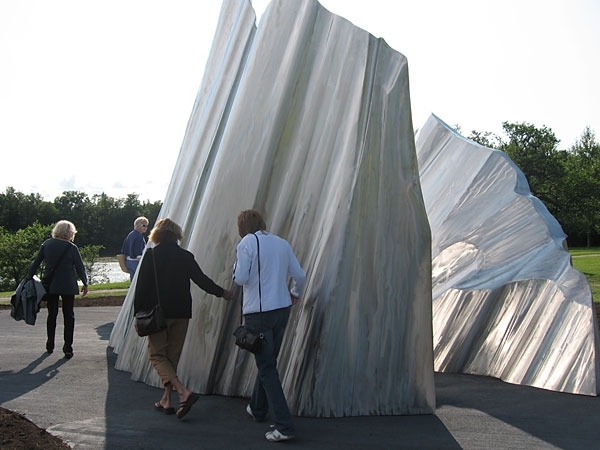 The two larger pieces are placed close together but wide enough apart for people to walk in between, creating an interesting tension in an otherwise wide-open green space. 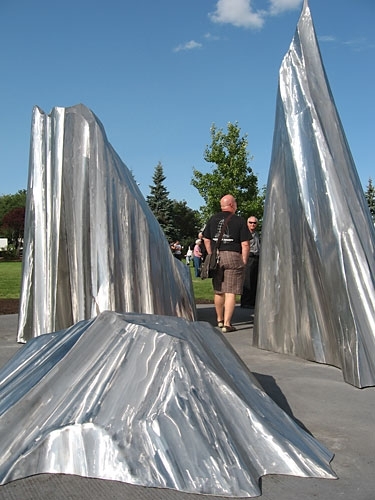 The stainless steel reflects light and the surrounding landscape and so the surface changes continually as the sun appears and disappears and the seasons cycle through summer to spring. 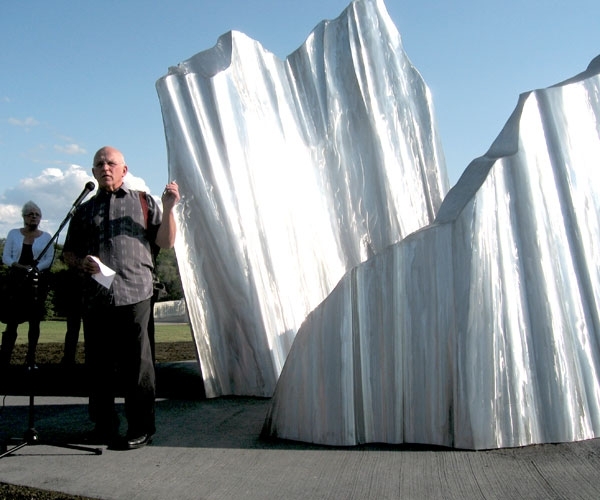 “The sculpture is more than the three monumental steel objects on a concrete pad. 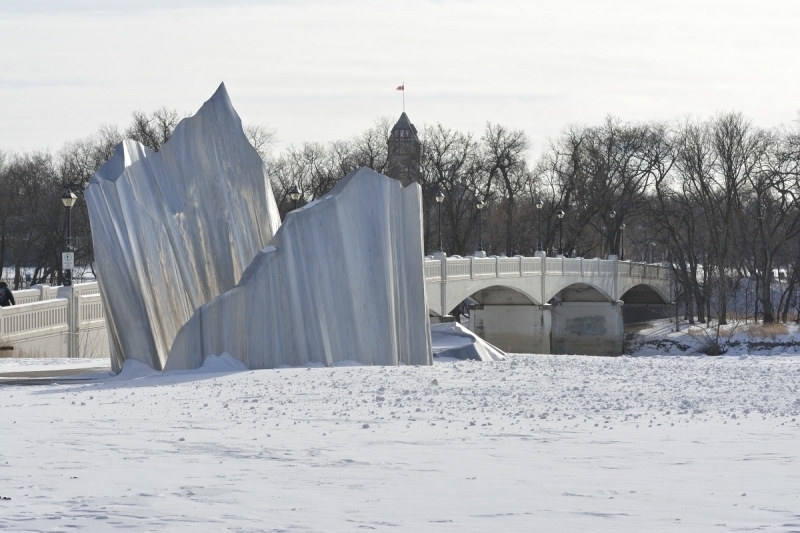 Rather Agassiz includes the entire site, an open grassy promontory overlooking a bend in the Assiniboine River as an integral part of the sculpture. Without this site this sculpture would not exist. The steel elements, of sufficient scale to be seen from several hundred metres distance, are situated between two existing paths. 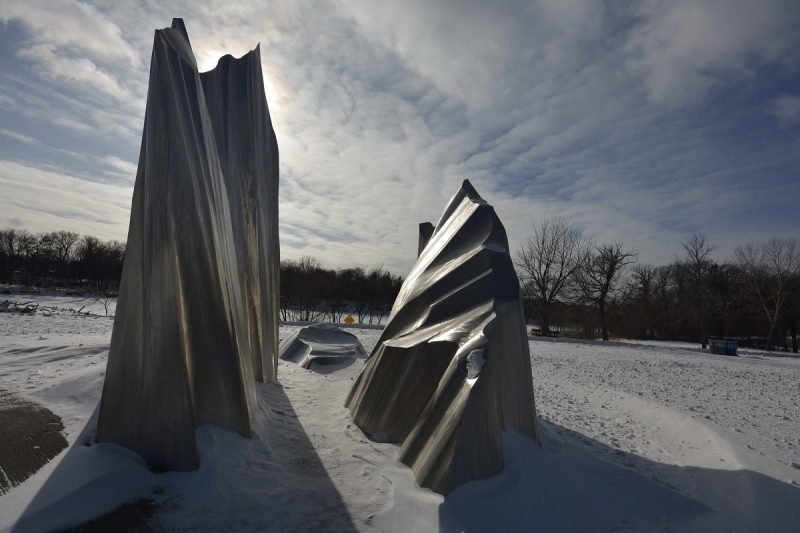 Connected to these and integrated seamlessly into the park system will be secondary paths leading to and through the sculpture. 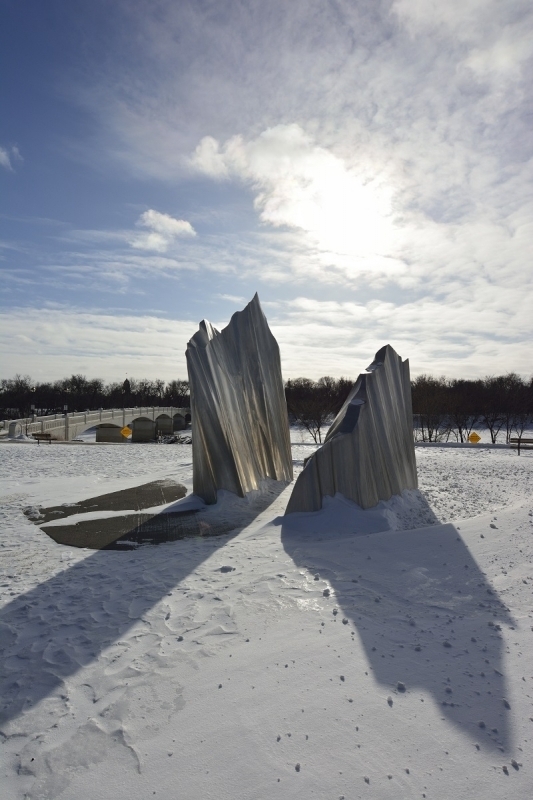 Sculptor Gordon Reeve, a native of Chatham, Ontario, is a Professor at the University of Manitoba School of Art and the Chair of the Sculpture Department. He obtained his BFA from the Cranbrook Academy of Art and his MFA from the Rhode Island School of Design. His best known sculpture, Justice, (12.8 metres high, 15 metric tons) stands in front of the Provincial Court Building in Winnipeg. Professor Reeve has also written and produced 16 documentary films and won important awards at major film festivals.